"Convenient Pill Organization for All Day, All Week"
Weekly Pill Planner Braille - This sturdy Braille pill organizer makes arranging your meds a breeze. 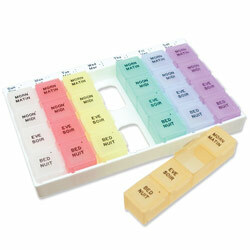 This Braille pill holder is color-coded to enable users with low vision to independently choose the right day's pillboxes. Each Braille pillbox also has tactile text in English and French indicating morning, noon, night or bed on the appropriate section. If you are going to be out for the day, just pop the day's attached Braille pillboxes out of the containing tray for easy packing in purse, pocket or briefcase. The lip of the containing tray is marked in Braille with each day's English initial. Also the first three letters of each day's name are marked in tactile letters on the tray's lip. Easy-open lids make taking your meds easier than ever before.